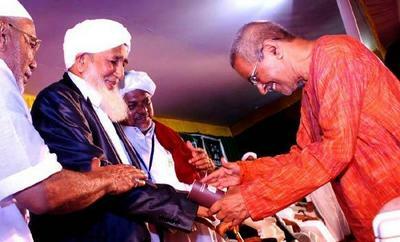 Qamarul Ulama Sheikh Aboobacker Ahmed greets a Hindu temple representative. 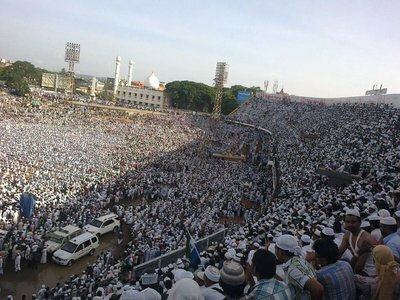 On Saturday, April 28, the greatest public campaign in the history of independent India, the "Keralayathra" or "Kerala expedition," conducted by traditional Sufi leader Qamarul Ulama Sheikh Aboobacker Ahmed, concluded jubilantly at Trivandrum, the capital of Kerala, having provided thoughtful lessons appropriate for the whole of mankind. It was, as all who witnessed it should admit, a most remarkable expression of solidarity, religious harmony, and friendly co-existence between people from all major religions and political parties. Appearing in 60 well-filled reception centers at 14 locations around Kerala state, the effort taught the reconstruction of the devastated foundations of human life. Through this revolutionary outlook, even secular-minded people became aware of the crucial roles to be completed by Sufis and Muslim scholars in the contemporary world. We were reminded of the sacred footprints of sheikh Khwaja Mo'inuddin Chishti Ajmeri, the "sultan of India" and king of the Sufis living in the sub-continent. He came from Madinah at the inspiration of Prophet Muhammad (peace be upon him) to lead the people to the light of Islam, and was influenced profoundly by people from the different religions, tribes, and castes. The recent Keralayathra, similarly, was a grand pluralistic representation of the multi-civilizational masses living in a secular country. A caravan of vehicles, following the inauguration of Thajul Ulama Sayyid Abdulrahman Al-Bukhari as the supreme leader of the conventional Sunni Muslims of Kerala, passed along roads lined on both sides by people with humane hearts. They waited a long time, irrespective of caste, sect, color, and age, for a glimpse of the great Kanthapuram A.P. Aboobacker Musliar, as our sheikh is known to many. He spoke to those assembled, saying, "Ideological differences and disputes should be resolved only by ideological means, not by the use of any kind of [physical] weapons." This was a statement that needed to be delivered by a spiritual leader, particularly in a state like Kerala where a peaceful atmosphere is frequently disrupted by gross communal and political atrocities. In all the reception centers, these meaningful phrases reverberated, as each of the sheikh's lectures was refined to confront the current significant issues in each specific area. At the same time, welfare relief aid was distributed to the down-trodden, needy, and marginalized. Ambulances and dialysis machines were delivered. At Thrissur, the largest city in central Kerala, a mass wedding was held for 11 women whose families could not afford the customary burden of large dowries. The campaign was not a speedy tour, but was slowed frequently so that our sheikh could visit the critically ill elderly and victims of unexpected misfortunes, offering them items they lacked. All these aid packages were made possible by the generosity of business and public leaders among our sheikh's numerous followers. Finally, the wave of humanity that filled the streets of Trivandrum on the evening before April 28 was not merely the conclusion of an event but an amazing phenomenon in which barriers between innocent human beings disappeared. Eminent leaders and distinguished personalities from religious, social, cultural, and political life were seated with Kanthapuram A.P. Aboobacker Musliar, proclaiming their full support for his journey and the comprehensive achievement of its ultimate goal: "A Humane Kerala." They expressed their confidence that as we had been recognized for realizing our long dream of "A Literate Kerala," so that we were called "the most educated state" by the rulers of India, we could become an example for the rest of the world by achieving "A Humane Kerala." Our sheikh commanded those gathered before him to take a "Humane Kerala" oath. This unforgettable and victorious concluding moment prompted him to recite Surah Al-Fatih and Salatul Tasbeeh, reminding the public that Prophet Muhammad (pbuh) had done so after the triumph of the Muslims at Mecca. As I anticipated in my earlier article, "Kerala, India: Awakening Humanity Through Sufism," published by the Center for Islamic Pluralism, Keralayathra has entered history. It proved that a rose may be counterposed to a physical weapon as a pen is to a sword. Some brilliant intellectuals, both partisan and non-partisan, wrote about the experience and frankly and bravely described it as a movement for justice and peace, against bloodthirsty incitement, and, as they cynically commented, "a whisper against thunder." The action of sheikh Aboobacker Ahmed adds an eloquent chapter to the chronicles of struggle for affirmation of human values. Many strategic events have been aimed at bringing a human message to all corners of Kerala. They included conferences, rallies, planting of trees, and, most successfully, more than 5,000 village conferences. All were motivated by the same ethical standard. Such may convince the devotees of other faiths that Islam has always promoted human solidarity and that the teachings of Prophet Muhammad (pbuh) should prevent any Muslim from joining terrorist conspiracies or embracing extremism. Syro-Malabar Catholic Bishop Rev. 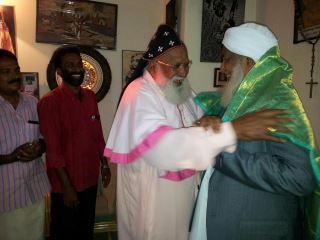 Father Thomas Mar Christos with sheikh Aboobacker Ahmed. The Rev. Father Thomas Mar Christos, the 85-year old Syro-Malabar Catholic bishop, to the surprise of all, appeared at one of the conferences in south Kerala, where he expressed his admiration for Kanthapuram. The honor given our sheikh is based in the pluralistic success of Keralayathra. Kanthapuram committed to this against all odds. Keralayathra has been successful, because of the principles it upholds and the intellectual leadership of Qamarul Ulama Sheikh Aboobacker Ahmed. Priceless values may be maintained by pursuing a moral and ethical life, for which the world presently yearns.